Mount Dora, Florida is a beautiful lakefront town of about 12,000 people in the wooded hill and lake country some 45 minutes northwest of downtown Orlando. The town has many antique shops in the downtown area, and a huge antique center called Renninger's on the outskirts of town. Mount Dora overlooks beautiful Lake Dora, one of the prettiest lakes in the famous Harris Chain. 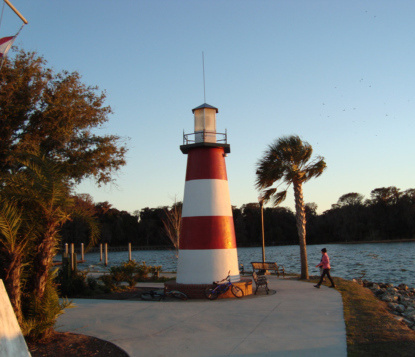 One of the most unusual attractions for this lakefront Central Florida town is its lighthouse. It is one of only three freshwater lighthouses in Florida. The citizens of Mount Dora got together and financed it. 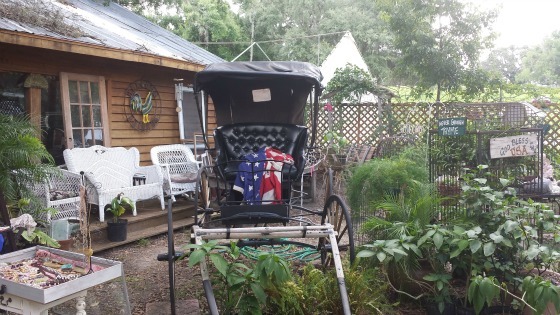 It was built in 1988 and is owned and operated by the City of Mount Dora. The lighthouse is a favorite photo backdrop for residents and tourists alike, and is a featured attraction on the local Segway tour. 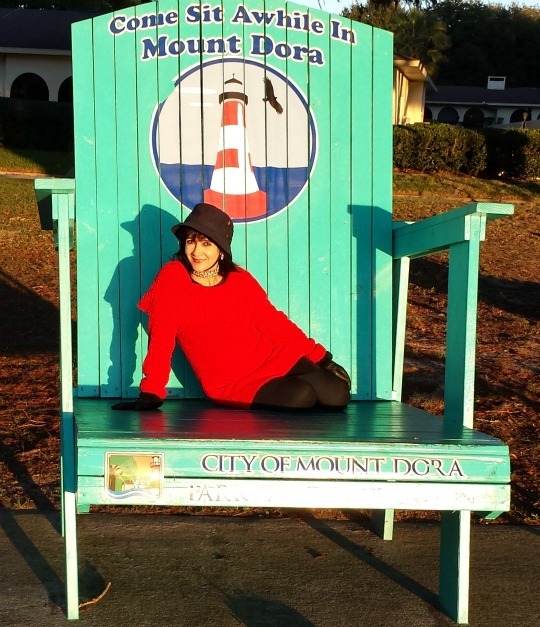 A recently installed giant chair in the park near the lighthouse is another favorite photo spot. Mount Dora always seems to have something interesting going on. The town hosts an annual art festival, craft fair, plant and garden show and many other special events including classic car shows. Here are some examples of recurring events that will give you a reason to visit Mount Dora several times. Renninger's Antique Extravaganza. The extravaganzas are held on the third weekends of January, February and November at Renningers Twin Markets of US-441 in Mount Dora, Florida. Each one of them is a large gathering of more than 1500 antique dealers hauling in their goods from all over the country. For more information, call 352-383-8393. Annual Arts Festival is held on the first Weekend in February. This nationally recognized fine arts festival attracts almost 300 artists from all over the country and other nations. The art is displayed on the streets of downtown Mount Dora and attracts thousands of art lovers. For more information call the Mount Dora Center for the Arts. 352-383-0880. Annual Mount Dora Music Festival, held on the third weekend in February. Presentation of artistic music including classical, big band and jazz. For more information call 352-385-1010. Mount Dora Annual Spring Show, held on the fourth weekend of March. 200 vendors display their crafts on the streets of downtown Mount Dora, Florida. For more information call Mount Dora Village Merchants & Business Association, 352-735-1191. Festival of Reading, held on the first weekend of April. Writer's contests, meet your favorite authors and various readings. Held at the W.T. Bland Public Library. For more information call 352-735-7180. Annual Sail Boat Regatta, held on the first weekend of April. The oldest regatta in Florida is fun for the entire family and takes place on Lake Dora near the Mount Dora Yacht Club. For more information call 352-383-3188. Annual Blueberry Festival, usually on the last weekend of April. The great freezes of the 1980s destroyed many citrus groves in Central Florida, and this festival celebrates the millions of blueberries now grown on former grove land. Elizabeth Evans Park, 100 N. Donnelly Street. For information call Janet Gamache at 352-217-8390. Annual Taste in Mount Dora, held on Third Sunday in May. A delicious evening of fantastic food prepared by the finest restaurants in the Golden Triangle Area of Mount Dora, Tavares and Eustis held at Lake Receptions between 5-8PM. Contact Mount Dora Chamber of Commerce, 352-383-2165. The Lakeside Inn is the centerpiece of downtown Mount Dora. Locals and visitors alike enjoy sitting in a rocker on the spacious veranda while watching the famous Mount Dora sunsets over Lake Dora. The hotel was built in 1883 and is on the U.S. National Register of Historic Places. July 4th Independence Day Celebration. A great celebration of our Independence Day of the United States of America with a parade, food and live music. It starts with a downtown parade at 10am, then other activities from 5-9pm at Gilbert Park with fireworks about 9pm. For more information please call 352-383-2165. Annual Bicycle Festival, second weekend in October. This major event draws more than 1,000 cyclists. It is Florida's oldest and largest bicycling event, with rides of varying lengths and levels of skill and difficulty. Cyclists of all ages come and see why Lake County is recognized as one of the best places in the world to ride according to the March 1998 edition of Bicycling Magazine. For more information call 352-383-2165. Annual Mount Dora Plant & Garden Fair, held in early November. Admission is free. Central Florida plant growers display more than 12,000 plants at Simpson's Cove on the downtown Mount Dora waterfront. Lake and Hills Garden Club Annual Garden Tour, first weekend in November. The club will lead tours of several distinctive gardens. Club members will be on hand to describe each garden and answer questions. Cost is $12 prior to the event and $15 day of event. Tours begin at the Country Club of Mount Dora. For more information go to lakesandhillsgardenclub.com. Annual Scottish Highlands Festival, held in mid November. Scottish bands and musicians plus highland games on Friday and Saturday. Elizabeth Evans Park at the far south end of Donnelly Street. Annual Light Up Mount Dora, is held the Saturday after Thanksgiving. There is a lighting ceremony between 5 and 9pm each year in downtown Mount Dora at Donnelly Park, with the lights actually being turned on at 630pm. Christmas Walk, a holiday street party on the second Friday after Thanksgiving. Sometimes this is in November, sometimes in December, with music, Santa and shopping in downtown Mount Dora between 6pm-9pm. For more information call 352-383-2165. Annual Christmas Parade, first Saturday of December, held at 1pm on the streets of downtown Mount Dora. For more information call 352-735-9629. Lighted Boat Parade, first Saturday of December, held each year on the Mount Dora waterfront near the Mount Dora Yacht Club. For more information call 352-735-9629. 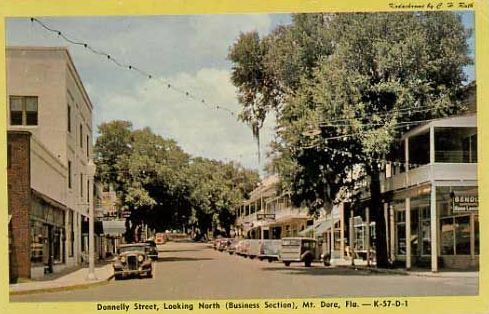 The Donnelly House is on Donnelly Street, the main drag of Mount Dora. It was built by an early mayor and is on the National Register of Historic Places. It is used today as a Masonic Lodge. The vintage postcard below shows Donnelly Street looking north. If you stand on the corner of 4th Avenue and Donnelly today you will recognize most of the features on this card. Learn more about the history of Mount Dora. Adora Inn, 610 N. Tremain St., Mount Dora, Florida 32757. Enjoy a gourmet breakfast in the dining room or peaceful front porch, relax in your beautifully appointed guest room or plan you next special event at Adora Inn. Located in the heart of the historical district in charming Mount Dora, Adora Inn is walking distance to the towns restaurants, shops, festivals, parks and only a short thirty minute drive to the Orlando theme parks. Adora Inn is a comfortable retreat for the sophisticated traveler. It is rated 3 diamonds by AAA, and was picked No. 1 for romantic weekend get-a-way by a Central Florida magazine. Grandview Bed & Breakfast. 442 East 3rd Avenue, Mount Dora, FL 32757. Tel: 352-383-4440. This lovely inn is just two blocks from downtown Mount Dora. This was originally the William Watt house, built in the early 1900's, and has been restored with rooms having private baths, queen beds, central air conditioning and heat. Full breakfast is served. Lakeside Inn. 100 North Alexander Street, Mount Dora, Florida 32757. Tel: 352-383-4101. 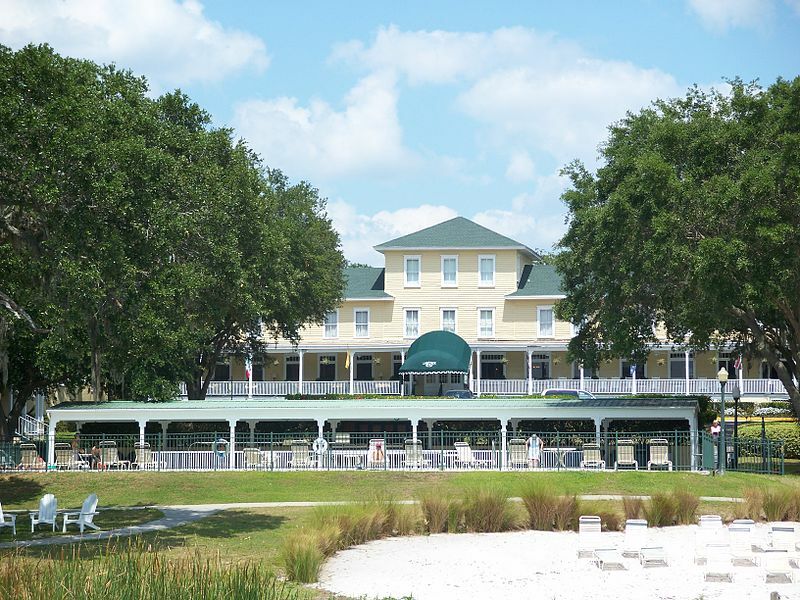 The Inn is the centerpiece of downtown Mount Dora with cozy rooms and good dining right on the shores of Lake Dora. On the National Register of Historic Places, Lakeside Inn was established in 1883. In 2010 a new owner took over who is renovating many of the hotel rooms. The Beauclair Room is the hotel's main dining room, open to the public, and right next door is Tremain's Lounge, a favorite hangout for locals. On cool evenings a fireplace crackles away in the corner of Tremain's. The front porch of the hotel is a great place to sit and rock and people watch and gaze out over beautiful Lake Dora. Mount Dora Historic Inn. 221 East 4th Avenue, Mount Dora, Florida 32757. Tel: 352-735-1212. 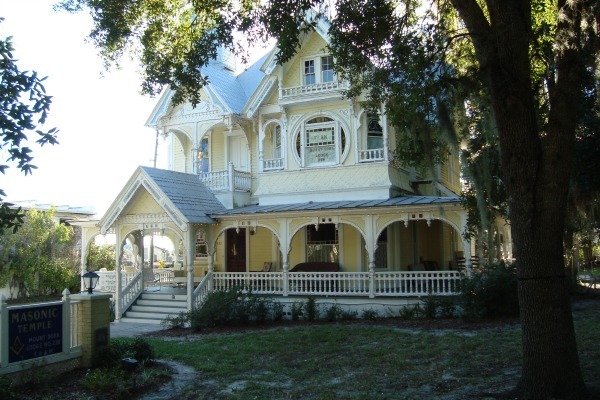 This historic inn is just a block or two from downtown Mount Dora on a shady tree lined street. The inn was built in the 1880's and has been lovingly restored with beautifully appointed rooms with private baths. 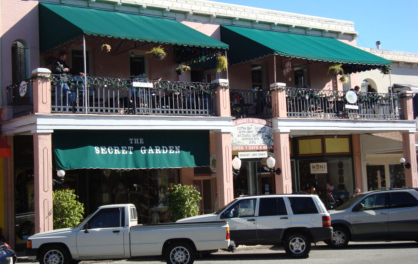 MOUNT DORA, FLORIDA RESTAURANTS is a list of the restaurants that I've personally tried and enjoyed. If it isn't on my list, I either didn't try it or didn't enjoy it. 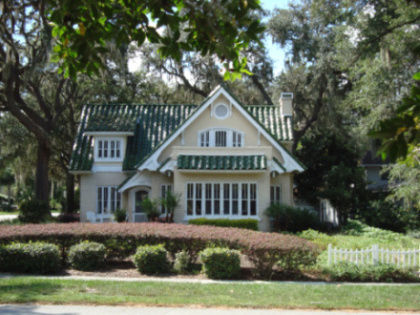 Many old houses in Mount Dora have been lovingly restored and maintained over the years. The one in the photograph below always appeals to me. It is on Morningside Drive in the Sylvan Shores neighborhood and recently sold (2016). Read the interesting story about the Unity in the Community Archway that you will see in Simpson Cove along Lake Dora.